Why Upload to GEDmatch or FTDNA? What is the advantage of uploading AncestryDNA results to GEDmatch and/or FTDNA? Let me count the ways… Here are my top 10 reasons.
. To get Matches with emails. And most at FTDNA have real names; many at GEDmatch have real names.
. To get cooperative Matches. A much higher percentage of folks who test at FTDNA will work with you on genealogy. Same with folks who have taken the trouble to upload to GEDmatch.
. The shared segment data allows the tester, or a Match, to evaluate the segment – a small segment indicates a distant relationship; a large segment, or multiple segments, indicates a closer relationship.
. The shared segment data allows the tester, or a Match, to group segments from Common Ancestors – you will tend to have only one (or very few) different segments from a distant ancestor, and this is where you will find other cousins from that ancestor.
. With Colonial American ancestry (and other endogamous populations), you may have multiple Common Ancestors with a Match. The shared segment data will allow you to determine which ancestor the DNA came from, because all who have the same shared segment data should descend from the same Common Ancestor.
. Admixture (ethnicity, ancestral geography) reports are different at different companies. GEDmatch, in particular, has several utilities with a range of admixture evaluations that target different areas.
. GEDmatch has other utilities, including seeing if your parents were related. Readers are invited to add other reasons to upload AncestryDNA results to FTDNA and/or GEDmatch in the comments section. I’ve highlighted the segments (in yellow) that we wound up with in Figure 1, just so you (and I ;>j) can keep track of them as we go through the recombination process. Note that with only 2 crossovers per generation, there are not a lot of subdivided segments. 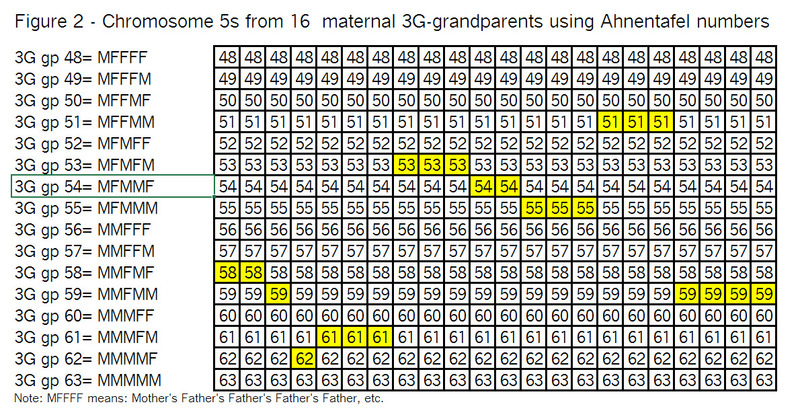 In the left-hand area, “3G gp” is Great, Great, Great grandparent; the numbers 48 to 63 are Ahnentafel numbers; and M means mother; F means father. The highlighted segments are all in the chromosome which gets passed on to the child. 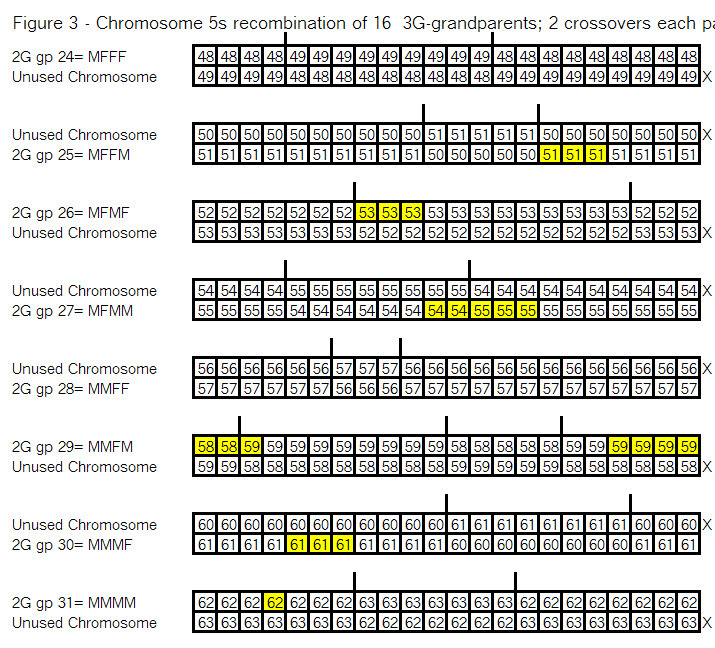 Note that at each generation, the highlighted areas “cover” the whole chromosome. One of the two chromosomes is X’d as it is not passed to the child. The child is noted by an Ahnentafel number which is half – e.g. 28 is the child of 56 and 57. Same as observations from Figure 3. Compare these segments (Ahnentafel numbers and locations) with Figure 1. A comparison with Figure 1 shows the same outcome with a Bottom Up review. There were many of the “random” recombination points above which could have been different because, in the end, that portion of the DNA was not passed down. But certain recombination points had to be where I selected them (not at random), because I was working toward a known chromosome map – the one we came up with in the Bottom-Up review. If I had been truly random in the Top-Down analysis, I could go back and recreate the same answer using Bottom-Up. The point is that you can arrive at the same answer using a Bottom-Up or a Top-Down analysis. Your DNA already has all of these recombination points in it. Triangulated Groups will help you define these points. Remember there are about 70 recombination points created across all of your chromosomes in one generation – usually a few more from your mother’s side, compared to your father, but it’s an average, and DNA is random. Note that your recombination points will not be the same as your Match’s recombination points – your Match almost certainly did not get the same ancestral segment you did (re-read What is a Segment? for the difference between ancestral segments and shared segments). This is one of the key reasons why spreadsheets (with shared segments) for different people should be kept separate. Although you may have a shared segment with a Match, there is no correlation between your ancestral segments/crossover points and your Match’s. We can see above, the generation where a particular ancestor’s DNA is no longer included. We noted this in the Bottom-Up post as well. Although that ancestor is no longer on this chromosome, he/she could well be on a different chromosome. Note that the ancestors whose DNA is no longer included on your chromosome, is not the result of segments being subdivided into oblivion (or even small segments that don’t show up as a match). Ancestors dropped out of the picture largely because their DNA was on the chromosome that was not used. At every generation, half of the DNA involved is not used! It’s no wonder, some ancestors drop out. Again, we are not talking about little pieces of DNA, but large chunks in many cases. You are encouraged to take pencil and paper (or a spreadsheet), and try variations on crossover points and recombination. Play with crossover points at various locations. Put them close together in one generation to create a very small ancestral segment. Or try dividing segments in half with each generation (averaging, say, 2 crossovers per generation) and see how many generations there are before all the segments are below a threshold (say 7cM). I think you’d be surprised at how many generations back you can go. And if you unbalance the process (not cutting each segment in half (50/50), but say 25/75, or even 10/90), you will get even more generations with above threshold segments.